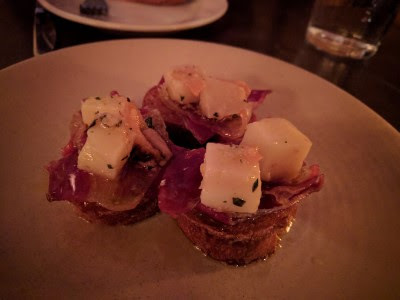 Last weekend we went out for SP's 3rd and final birthday meal: dinner, just the two of us, at Morcilla. We both like Morcilla a lot. 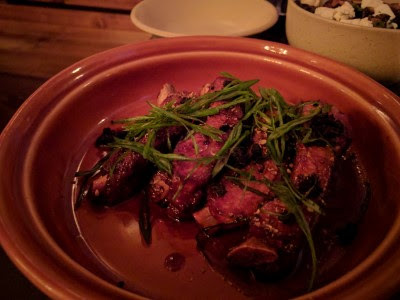 This time, in addition to our usual favorites, we tried some new-to-us dishes. The Jamon con Queso was so good! 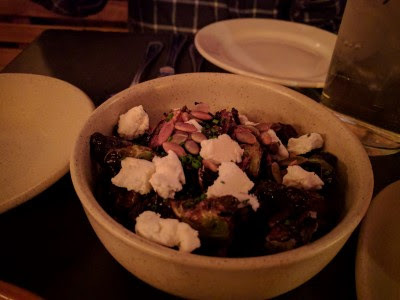 These Brussels sprouts might be our new favorite Brussels. 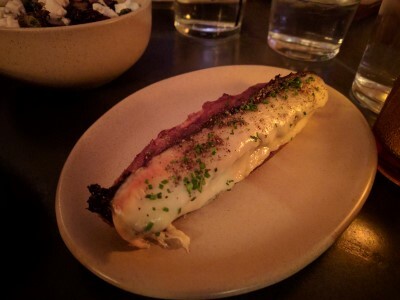 I liked the crunchy pepita, the smoky, creamy cheese, crisp Brussels with the bite of sherry. So. Good. 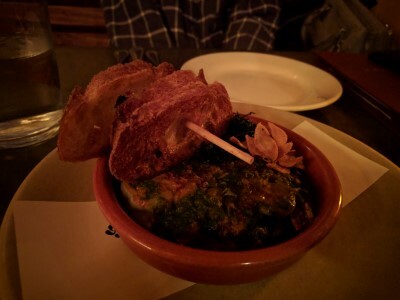 Yes, we always order the Oxtail Montadito but I took a photo because it's a different presentation. It's on a longer baguette looking bread instead of crostini looking bread. One of us may have remarked that it now looks like a tail. Ribs! Yum. SP asked me if I was going to be a dainty girly and use fork and knife. I said yes. He did, too, but had no qualms about picking a rib up and getting his hands all messy. 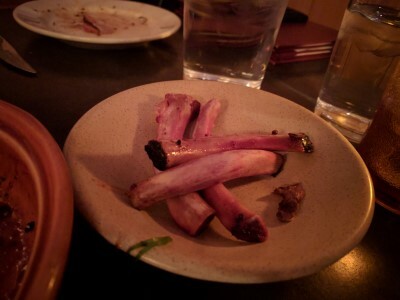 I found that these were so tender that the bone just slid right our of the meat. We ate all the pork rib meat. Buried under the sauce in the bowl are 3 large shrimp. In the top right of the bowl you can see the toasted garlic - the danger zone for me! I avoided the garlic. Of course we ordered the churros. 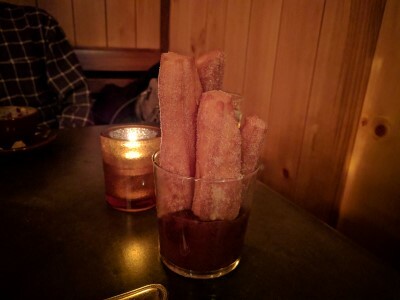 Instead of 2 long churros, there are now 4 shorter ones standing up in a glass with the sauce in the bottom. Still yummy. Another delicious meal with great service. Since then I have felt crappy and I was playing the "Allergies or Cold?" game. That went on for several days but last night it became apparent it is indeed a cold. I feel horrible. SP went out this morning before work to buy me medicine. I can't even sleep, I keep waking up and tossing & turning and ache everywhere. Dessert: Girl Scout cookies, popcorn, M&M's. No baking this week. Lots of chicken, but I really wanted chicken soup because of how I have been feeling. Victoria ended. It was good, but the last episode seemed a little plodding. Worst Cooks in America ended. I don't want to spoil anything in case someone hasn't yet watched but while I am happy with the winning chef, I am not happy with the winning contestant. I think the other chef/contestant should have won. The Americans is back! Although I was confused for the first 15 minutes. Taboo has been renewed for a second season. More brooding Tom Hardy! We watched Moonlight. Really good movie. Now I need to see La La Land. And Fences & Hacksaw Ridge & Lion. I sure hope Dish & Hearst settle their contract dispute soon. I had to set up manual timers for the OTA WTAE channel to record my shows. Yup. First world problem. But it's so nice to simply let the DVR pick up the new episodes of my shows. No wondering whether or not it's new. The Agent Runner by Simon Conway. Enjoyed this a lot. Not everyone enjoys spy/international intrigue/thriller books, but I do, and this is a good one. Rules of Civility. Yes. It's taken a while but once I finally sat down and started reading I found myself engrossed and not wanting to put it down. Just as enjoyable as Towles' A Gentleman in Moscow.